When Kenny Chesney released Live in No Shoes Nation, a two-disc live recording (Blue Chair/Columbia Nashville), people thought he was crazy. Who buys records of concerts they’ve already been to? But Kenny Chesney, who’d been listening back to the members of No Shoes Nation shouting, singing and cheering along over the previous decade, was blown away by the passion in venues ranging from Gillette Stadium to Red Rocks, the Rose Bowl to Asbury Park’s famed Stone Pony – and he wanted the fans to experience the rush, the energy and the passion he does every night listening to their voices. Now Live in No Shoes Nation, the 29 song collection featuring Chesney’s famous and not-so-famous friends, has been certified platinum. With his Songs For The Saints having just arrived, it’s a heartening certification for the man crowned “The King of the Road” by The Wall Street Journal and “The People’s Superstar” by The Los Angeles Times. From the opening “FloraBama,” recorded on the beach that spans the Alabama/Florida line, through the intimate “Happy on the Hey Now (A Song for Kristi),” it’s a decade in the life of one of America’s most consistently buoyant and real-life affirming artists. 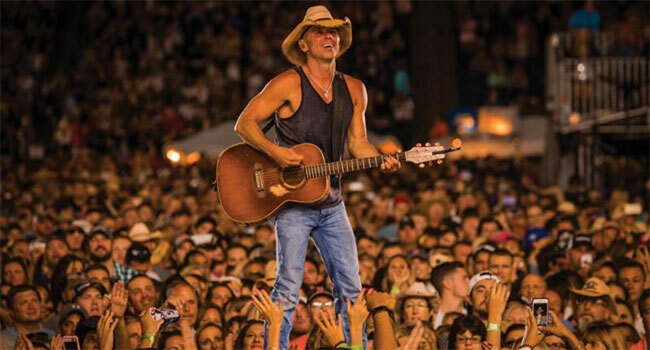 In a world of big claims and inflated numbers, Chesney’s million-plus summer tours have become a right of friendship, celebration and coming of age over the last dozen years. Joined by Grace Potter, Dave Matthews, Eric Church, Taylor Swift, Mac McAnally, Zac Brown Band, David Lee Murphy and Old Dominion, Live in No Shoes Nation is also a core sampler of the American music this century. Beyond the guests, the vocals from No Shoes Nation and the continuing roar of the crowd, there are rare jewels, from the intimate (Guy Clark’s “Hemingway’s Whiskey,” Bruce Springsteen’s “One Step Up”) to the effervescent (“Guitars, Tiki Bars,” “Boston”). “Songs have always been postcards or watermarks of moments for me,” Chesney says. “I can’t tell you how many memories I have a song for. Knowing how many friendships have been forged at our shows, how many engagements and good times, I figured the people of No Shoes Nation might like to have the moment as well as the song. Nine months later, here we are… and the thing I was told couldn’t happen in today’s world just has.